“The good news is that most of our service members should see a substantial reduction in their overall federal taxes for 2018, even if their itemized deductions are either suspended or capped because of changes in the tax code,” said Army Lt. Col. David Dulaney, executive director of the Armed Forces Tax Council. The reduced tax rates will result in an overall reduction of 3 percentage points for most military families, compared to the rates for 2017. Most military couples filing joint returns make well under $165,000, he said. Those making up to $165,000 are taxed at a rate of 22 percent; those making up to $77,400 are taxed at 12 percent; $19,050 and under, at 10 percent. The increased standard deduction is now $24,000 for married couples filing jointly; $12,000 for single taxpayers; and $18,000 for heads of household, which is double what it was in 2017. The increased child tax credit, allows those with dependent children to claim a credit of $2,000 for each child, double that credit in 2017. Dulaney highlights some changes and considerations of special interest to military families. You CAN still deduct unreimbursed moving expenses related to Permanent Change of Station moves. While DoD covers most of the expenses for service members when they move, there are still some unreimbursed expenses, and you can deduct them ― unlike civilians, where these deductions are no longer allowed. Many military spouses got a big break when the Veterans Benefits and Transition Act of 2018 was signed into law. It’s retroactive for all of 2018 for those who were married as of that year. That law allows spouses to use their service member’s state of legal residence for state and local taxes. It makes it easier to file taxes, because you won’t have to file for different states ― except for those who paid state income taxes in 2018 and want to change their state of residence. You’ll be eligible for a refund of those state taxes you paid, and you’ll have to file a tax return with that state to get it. And for the state you are now claiming as your legal residence (the same as your service member), you’ll need to file a return and pay any taxes due. There are seven states that have no state income tax ― Texas and Florida are two examples, home to many service members. Don't file your 2018 tax returns before you read this. Military spouses have this new right, but get advice from your legal assistance office first. Those who served in the Sinai Peninsula are now eligible for combat zone tax exclusion dating back to June 9, 2015. Since taxpayers generally have up to three years to file an amended tax return to make a claim for a refund, those troops who served in the Sinai back in 2015 need to get it in quickly, because their 2015 tax returns would have been filed in 2016, and they have three years from that point to file, generally. Those in the Reserve component are no longer able to deduct drill duty expenses for tax year 2018, unless it’s for travel for more than 100 miles to the drill duty location. The Tax Cuts and Jobs Act suspended all miscellaneous itemized deductions, but for those who are traveling more than 100 miles can take it as an above-the-line deduction. Marines have lost a deduction that they alone had been allowed for the wear and tear, and care of, their military uniforms. That was not deductible for anybody but Marines, Dulaney said, because Marines weren’t authorized to wear their uniforms in a non-duty status, so the Internal Revenue Service allowed them to take an itemized deduction. Since miscellaneous itemized deductions have been suspended, “unfortunately Marines are no longer able to take that deduction,” Dulaney said. That said, even though the itemized deductions have been lost, most military members will still have less overall taxes, Dulaney said. Free, expert tax preparation services are offered through the legal assistance offices on most installations in the U.S. and overseas. These volunteers receive more than 80 hours of training, and are certified by the Internal Revenue Service through the Volunteer Income Tax Assistance (VITA) program, Dulaney said. They prepare both federal and state returns, and there’s no limit on the number of state returns. Eligible clients typically are all active-duty service members and retired members and their dependents. 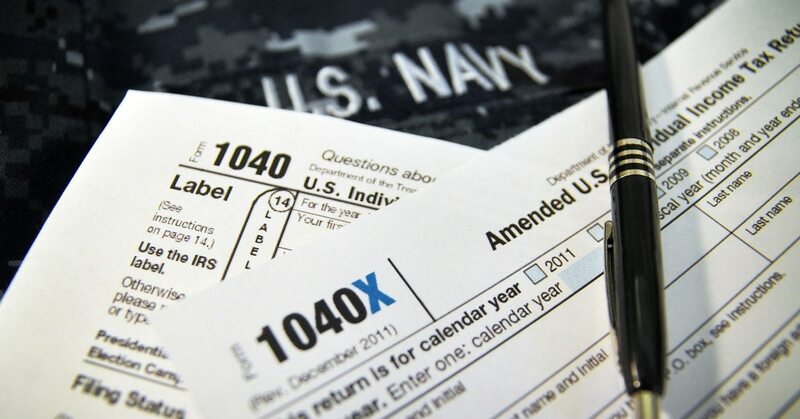 Visit https://www.militaryonesource.mil/vita-location-lookup to find military tax centers near you; not every installation is able to offer this resource. If you want to do your taxes yourself, visit MilitaryOneSource.mil for the MilTax free tax services at www.militaryonesource.mil. That includes free tax prep software, personalized support from tax consultants, and the latest information related to military tax filings. Those eligible for MilTax are all active-duty, Reserve and Guard members regardless of activation status, their family members and survivors. Those leaving the military can use the Military OneSource free resources for up to one year past separating or retiring.